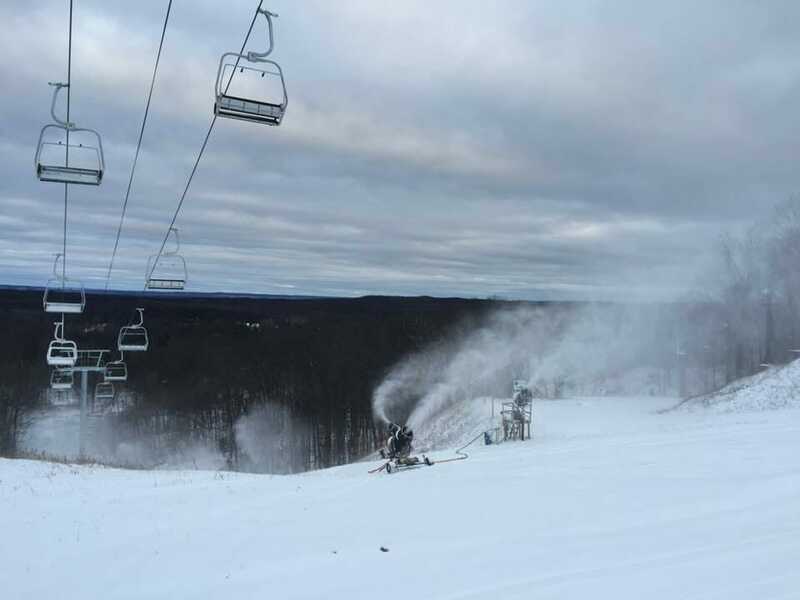 An overview of snowmaking operations at Caberfae Peaks with their snowmaking expert, Tim Meyer, article written by Maralee Cook. Picture this: You’re enjoying the outdoor heated pool and spa late at night at Caberfae Peaks Resort, gazing up at the stars after an exhilarating day on the slopes. Most likely, the last thing on your mind is what it takes to produce four to six feet of base on the resort’s 34 trails. If it’s mid-November to early December you may hear snow-making machines running in the distance. If it’s mid-January, with night-time, single-digit temps and a little help from Mother Nature, it’s possible all you’ll hear are the mysterious night sounds from the surrounding Manistee National Forest. What most won’t realize is that providing a top-quality base of snow for skiers is on the minds of the resort’s owners every day of the year. 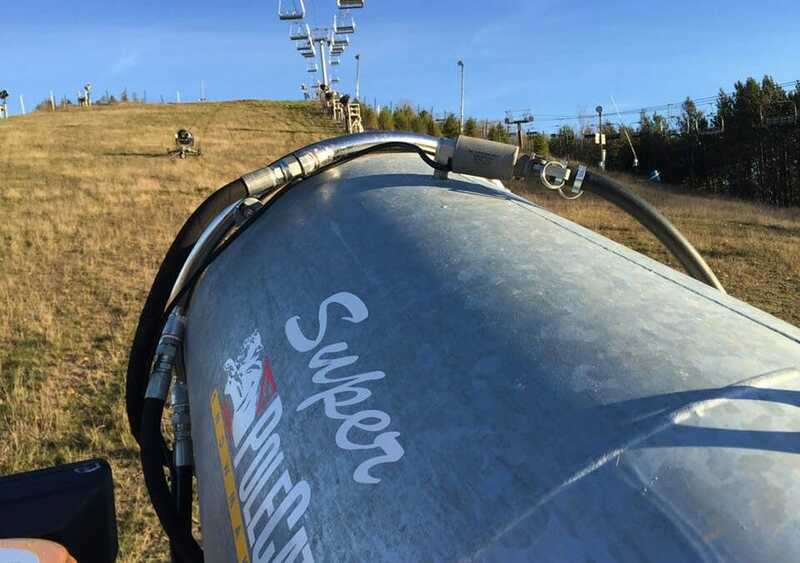 One of the many fan mobile fan guns that blanket the slopes at Caberfae in preparation of snowmaking efforts. Caberfae has been owned and operated by the Meyer family for over 35 years, since brothers Tim and Jack Meyer purchased the property in 1981. Their sons, cousins Tim and Pete Meyer run the resort now. Tim, Mountain Operations Manager since 2002, spent several years at Winter Park Resort in Colorado before returning to Caberfae, and knows well the difference between Mother Nature’s natural snow and man-made snow. 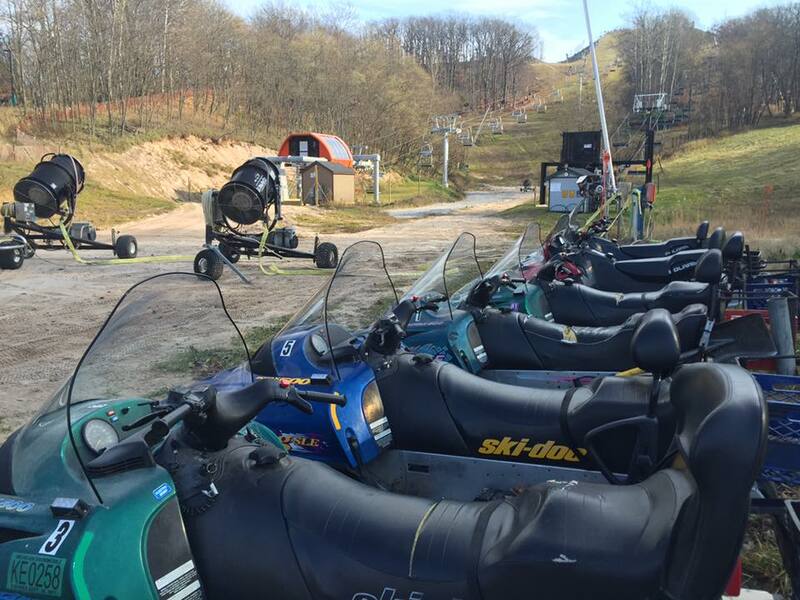 Snow guns and snowmobiles are at the ready for snowmaking. Caberfae has 132 snow-making machines, both mobile and stationary, in two models-fans and sticks. Water droplets are shot into the atmosphere under high pressure through tiny nozzles, breaking them into a fine mist. Then an air/water mix is added which creates the seed for the water droplets to attach. This creates a snowflake which falls to the ground, says Tim. 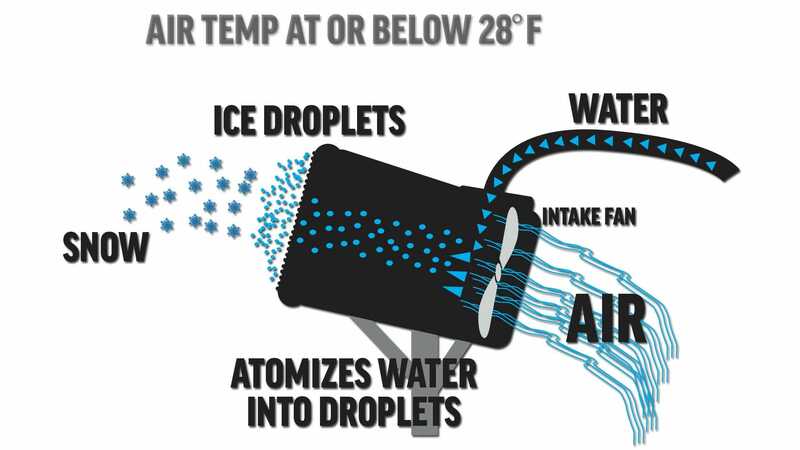 A basic diagram of how snow is made with the fan guns at Caberfae Peaks. Air and water are mixed together and atomized into water droplets. These droplets are mixed with tiny ice droplets as they exit the barrel of the fan gun. This combination makes machine made snow. Snowmakers control the amount of water and flow to create a perfect machine made bed of snow. The entire process depends on the combination of three factors: temperature, humidity and wind. “We can turn on the machines at 28 degrees Fahrenheit when the humidity is 80% or less for marginal conditions. As the temperature drops, snow quality improves-the quality of the flake is drier. The lower the humidity, the better the snow making conditions are. Snow remains too wet if the humidity is high,” he says. For instance, with a fan gun starting at 28 degrees, you will use 16 gallons of water per minute – a low flow, for marginal snow making. When temps drop to the low 20s, you can add a second nozzle bank, which adds another 16 gallons per minute, for a total of 32. At 15 degrees, add a third bank, now you’re at 45 ½ gallons per minute. If it’s single digits, add a fourth bank for 59 gallons per minute. Every snow making machine uses its full horsepower regardless of the temperature. The colder it gets the more water you can put through each machine for a more efficient operation. A fan gun running 24 hours at 28 degrees produces a 60×60-foot plot 8-10 inches deep. It gets bigger and deeper at 20 degrees, and still bigger and deeper at 15 degrees. When you get into single digit temps, you can create a pile of snow the size of a school bus in that same 24-hour period. Q: Why select a fan or a stick? are offered with manual and automatic control options. Tim calls snow making, “Part science, strategy, experience and luck. We study three different weather forecasts: NOAA has the most accurate forecast. We look at weather.com for the 10-day outlook and Accuweather for long-range trends,” he adds. “Our skiers are interested in when we’re making snow. They like to know we ran the machines the night before. In the early season we run them all the time, graduating to nights only when it gets colder,” says Tim. Snow guns are all on at Caberfae Peaks to kick off the start of the 2016/2017 winter season! Tim is a long-time member of the National Ski Patrol and he skis with his family, to spend time together and check on the product, he says with a smile. But come summer, during backyard BBQs with family, they’re still talking about making snow-what worked and what didn’t, and how to make a better product for the next season. For Additional information about snowmaking, visit the snow makers website here.